4 Leaf Cuttings. This is the most inexpensive way to get a start of these wonderful plants, and the way my grandmother has passed this plant on to friends and neighbors for over 30 years! 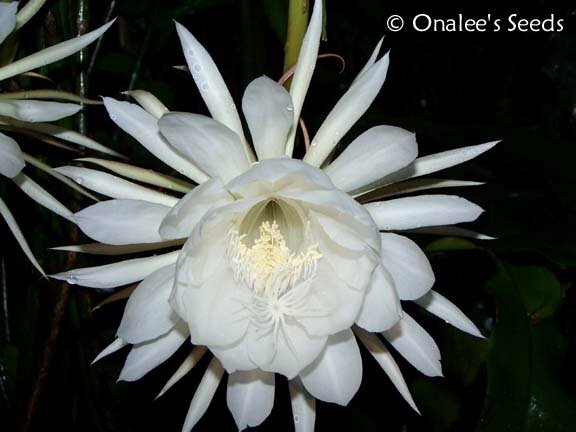 These Orchid Cactus plants get pure white flowers,the size of a dinner plate which open as soon as the sun goes down and stay open all night, closing in the morning.It blooms in waves during the summer months and the blooms have a wonderful, unforgettable fragrance. 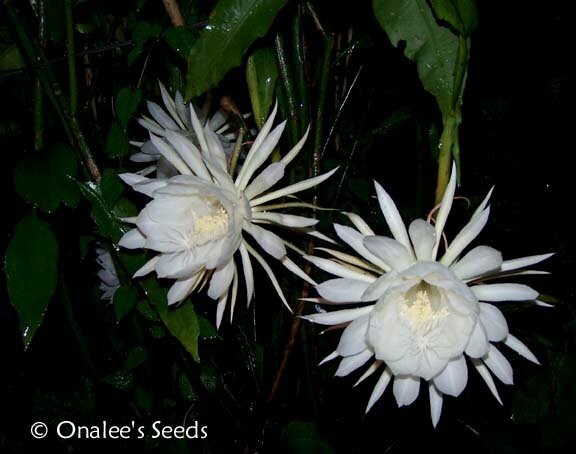 You are buying 4 unrooted leaf cuttings of Night-blooming Cereus, Queen of the Night, Dutchman's Pipe Cactus (Epiphyllum oxypetalum). Each cutting will be from 4 - 6 inches long. These plants are SUPER EASY to root simply place each leaf cutting, cut end down, into some well draining (cactus suitable) soil. Water sparingly (don't allow water to stand), as you would a cactus and within a few weeks you'll have rooted, growing plants! This is the most inexpensive way to get a start of these wonderful plants, and the way my grandmother has passed this plant on to friends and neighbors for over 30 years! These Orchid Cactus plants get pure white flowers, the size of a dinner plate which open as soon as the sun goes down and stay open all night, closing in the morning. These are long lived plants which often get shared via cuttings and the 'mother plants" get passed down through generations in families. unforgettable fragrance. As the plants get older and larger, the more blooms you will have on any given night. (In my experience, these plants don't bloom the first year grown from cuttings and may take up to 3 years to bloom). These are hardy to grow outside only in zone 10 or warmer, but are happy to grow in containers in part to full shade if protected from freezing temps in the winter.